Terra-cotta pots and saucers are readily available in garden centers, craft stores, and hardware stores, which makes decorating with them quite easy. 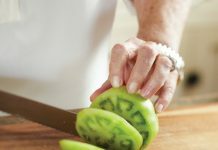 They are an all-time favorite of Paula’s, and she is always picking up a few new ones or reclaiming them from the potting table and doing fun things with them around the house. For this charming place setting, a small terra-cotta pot is filled with a simple floral arrangement and covered with a glass dome with a seed packet attached as a party favor. A large terra-cotta saucer is used as a charger to house the dinnerware. A medium terra-cotta pot works perfectly as a utensil holder in the kitchen, and the rich earth-tone color blends nicely with a mix of natural surfaces and finishes. When entertaining calls for extra seating and tabletops, convert an oversized pot and saucer combination into a creative and cost-efficient side table. 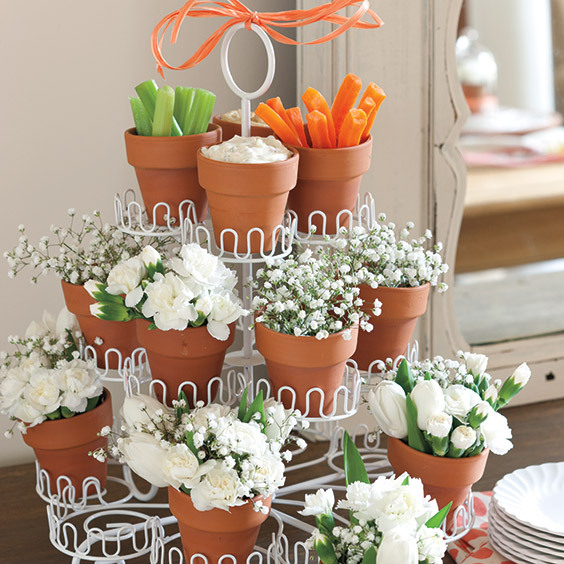 A cupcake stand creates a working centerpiece when it houses small terra-cotta pots filled with both flowers and appetizer treats on top. When storing food in any terra-cotta container, line the inside of the piece with foil, plastic wrap, parchment paper, or wax paper before filling with food.